This is, already, my last week of maternity leave. I've been off work for eight weeks (my last day at work was the Friday before Ian was born). A week from today I go back -- I'll be working half-time for the next eight weeks, and then once that time is up I'll be going back full-time, though with a modified schedule so I can be at home with Ian a couple of days a week. Part of me is looking forward to having a few hours a week in which I am (mostly) surrounded by adults and don't have to keep an eye on the baby...but then I look down at my little guy, who is just now starting to get interesting and interactive, and wonder how on earth I can possibly be even CONSIDERING leaving him. Sigh. I guess motherhood is all about guilt, isn't it? And I've managed just a little bit of crafty stuff. 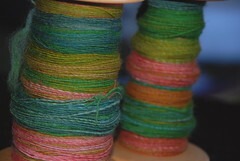 Some spinning: a 50/50 wool/bamboo blend, dyed by Creatively Dyed and purchased at Rhinebeck in 2008. 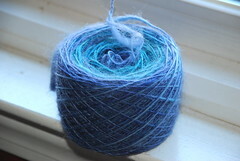 I started predrafting this fiber during the first week that Ian was home, and finally did the plying last week. I LOVE THIS YARN. 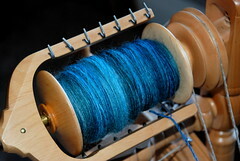 It's smooth, shiny, oh so soft, and perfectly balanced -- not bad at all for my first time spinning since, oh, last summer? 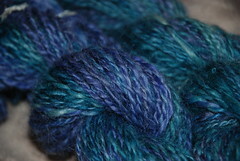 It's about 210 yards and is sort of light worsted, as is most of the yarn I spin -- that seems to be my default setting. 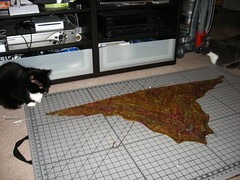 And a little bit of knitting: this boring blob is a Multnomah shawl. 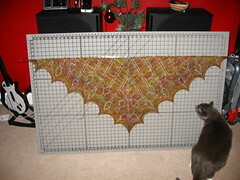 I've just started the lace portion, though you can't tell in the picture. And contrary to popular belief, this isn't a hat. It's a hippopotamus body, duh. I got this done during the Worldwide Knit in Public Day event that I ran at my library on Saturday. 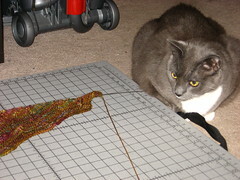 I don't think the rest of this project will take very long, in terms of actual knitting time. 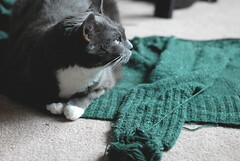 Given how infrequently I knit, though, we'll see how many weeks it is before we have a completed project! In other news, Gandalf is inching closer and closer to Ian. 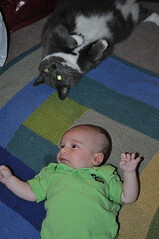 Someday Ian will notice that the cats exist, and then they'll be in trouble. 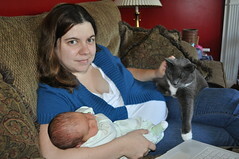 Before Ian was born, I was feeling a little guilty about shaking up our cats' lives. I know, I know, that sounds kind of funny -- but they're ten years old, and for those ten years they've totally been our babies. Even though they're really easygoing cats, I was afraid that the changes to their home and their routine would be really stressful for them. I wasn't worried about them acting out or anything -- they're not like that, so such a reaction would have really surprised me -- but still. Luckily, there was no need to worry. Gandalf mostly just ignores Ian. Maggie does too for the most part, but unlike Gandalf she'll actually go up to him and sniff him every now and then. My prediction was wrong, though -- usually Maggie's the more uptight of the two, and I thought it would take her a lot longer to warm up to Ian -- but she's thawing more quickly than Gandalf. If Gandalf is feeling especially needy, he'll share a lap with Ian, but he won't go near him without a grown-up-human buffer. 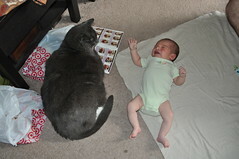 We wanted to be sure to get a comparison shot because the size difference -- 18lb cat, 8lb baby -- is pretty hilarious, but it took some doing. We had to wait until Gandalf was mostly not paying attention, then I had to stand with the camera and get it all aimed and focused and everything, and Jim had to quickly plop Ian on the floor next to Gandalf, who ran away about 3.2 milliseconds after I snapped the picture. I think it's just a matter of time before Maggie and Ian are playing together, inasmuch as one can play with a cat (of course, he hasn't even NOTICED the cats yet). 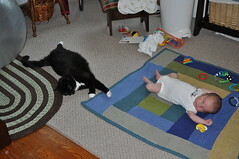 She's pretty comfortable around him and will frequently hang out nearby. We have Ian sleeping in a cosleeper-type basinette alongside our bed, and since we brought him home, Maggie, who is usually our nighttime companion, hasn't been sleeping with us. We figured she was staying away because of the baby. But three nights ago, she was back! Life is returning to normal, or at least as normal as it's gonna get. I'm a day late with this post -- I tend to crash pretty early on Fridays -- but I couldn't let April 16 pass by unnoticed. 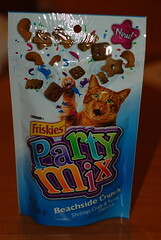 Our cats turned ten! It's hard to believe that they're ten years old. On the one hand, it's impossible to imagine life without them at this point (and, consequently, it's hard to remember a time before them! 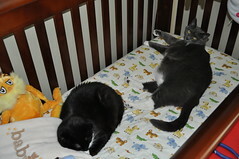 ), but at the same time, they're both still so kittenish (especially Maggie) that it's difficult to think of them as being on the verge of senior kitty-hood. Maggie and Gandy were born during the spring of my senior year of college. 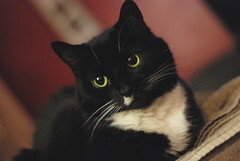 Jim and I were getting married just a couple of months after my graduation, and we knew we wanted to adopt a cat. As it happened, my mom's cat got pregnant, and so we planned on keeping one of her kittens. I happened to be home visiting my mom, purely by coincidence, on the day the kittens were born, so I got to meet them all when they were brand new, teeny-tiny, and still a little sticky. ;-) There were five kittens in the litter -- three were white with random tan spots, one was a grey tuxedo, and one was a black tuxedo with a little white mustache. I knew there was no way I could decide between the two tuxedo cats, so after a quick phone consult with Jim, we decided that they'd both be coming home with us when they were old enough. We figured they'd keep each other out of trouble. And, for the most part, they do. Like all siblings, they have their scuffles, but by and large they get along just fine. They're both just full of personality. We like to joke that Gandalf is actually a dog in a cat costume. He's very sociable and gregarious, greets people whenever they come to our front door, and is not afraid to demand attention. He's also a total lap cat. He's my handsome boy. 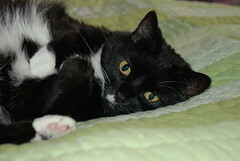 Maggie is more typically cat-like with other people -- a little standoffish and likely to disappear when we have company. 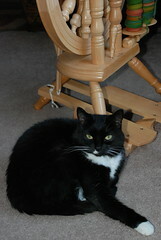 She's also a great judge of character, in our opinion -- if Maggie likes you, you MUST be an okay person. 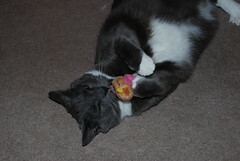 ;-) But with us, she's the more affectionate of the two -- she gives us love, while Gandy demands love. Maggie is always the one who herds us into bed at night, sleeps on our feet, delivers head-bonks copiously, and keeps watch over us when we're sick. She's also an expert at being as cute as possible whenever she does anything naughty. 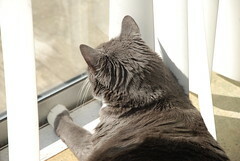 We keep them indoors all the time -- though every now and then we relent and let them poke around on the deck for a little while -- but they both dearly love to keep an eye on what's happening outside. 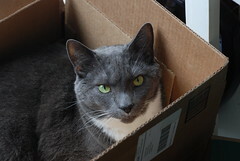 And, of course, like self-respecting cats everywhere, they love boxes and bags, catnip, bird-related toys, warm laundry, and licking condensation off the outsides of beer bottles. Now, although I don't think they really understand that they're getting a little brother soon, they're doing a good job of road-testing all of his new stuff. I can't wait to see how they interact with him. Gandy has always been extremely easy-going with babies and kids (plus he spends a lot of time draped over my belly), so I suspect he and the baby will be BFFs from the get-go. I think Maggie will take some time to warm up to the idea, but since she's so affectionate with us, I think once she figures out that he belongs with us, she'll be fine with him too. I can't imagine the last ten years of my life without my sweet, cuddly, fuzzy babies. Happy birthday, gatos! I've got a couple more finished objects from 2009 to get through here...I can't even blame an end-of-the-year knitting flurry for the backlog, just laziness at getting things blogged! Pattern: Milkweed, by Laura Chau/Cosmicpluto Knits! I had kind of a love/hate relationship with this project. I loved the pattern in theory, but didn't really enjoy knitting it (perhaps because, for some reason, I was NOT able to count while I was working on it. Baby brain?). The pattern was, however, VERY well written, and I particularly liked Laura's little touch of putting in numbers for the plain knitting sections, so when following the chart you wouldn't need to count that there were fifteen knit stitches in a row or whatever -- the "15" was right in the chart. Loved the yarn, but wasn't sure it was right for the pattern. And I wasn't crazy about how the finished product looked, at ALL -- until I blocked it. And I'm very happy with how it came out. So I don't know as I'd knit it again, but I'm glad I did. 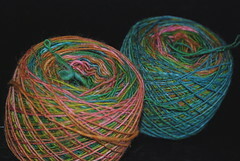 I'd had this yarn in the stash for some time -- it's technically sock yarn, I believe, but for me it falls into the category of "sock yarn that is too nice for socks" (I have a lot of this sort of yarn, which I think is behind my recent obsession with the minishawl). I decided on this particular yarn for this pattern because of the milkweed theme - the colors, in person, make me think of a flowering plant (a hydrangea bush, specifically, but there are others) when it's dried out and beginning to wilt in the fall. It was a hard color for me to photograph, but it's a beautiful rich reddish brown with teal, magenta, and greenish-yellow streaked throughout. Love it. The bits of teal made it a perfect companion to the dress I wore to my sister-in-law's wedding on December 26 -- but it was quite warm in the room where the wedding was and, despite being in a sleeveless dress, I wound up not needing the shawl and so there are no Action Shots of it in use. 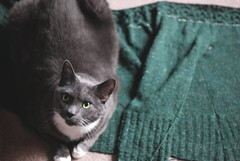 I do, however, have a series of photos demonstrating how helpful the cats were while I was blocking it (and also, how much it needed blocking!). 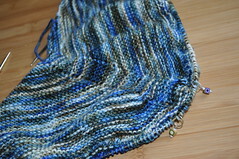 So now I need to decide on another minishawl to use up another skein of too-nice-for-socks sock yarn from the stash. Maybe Damson? Oh, blog, how I neglect you. 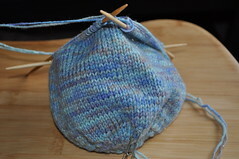 The knitting is moving along - the baby kimono, mentioned in my last post, is finished. I also finished the striped scarf from my last post - just need to sew in the ends and wash it to soften it up a little. And, of course, I have to take pictures of both. 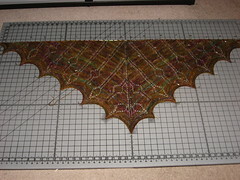 I've also got a shawlette that's nearly done - just a chart and a half left to do. And I've got yarn for the next few projects in my queue, which I will introduce soon. And there's the Christmas prep - another post to come. As you can see, Gandalf was NOT interested in letting Jim work the other night. 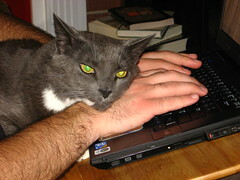 Jim was moving his hands around, typing, using the touchpad...and Gandalf stubbornly kept his head resting on Jim's hands. It was HILARIOUS. No pictures of that yet, in case my friends read the blog, so here's the other thing I've been plodding through over the last few weeks: a Noro striped scarf. Like the baby kimono, there is NO reason this should be taking me as long as it is. 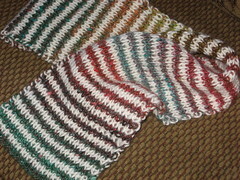 Obviously, it's only half-Noro - the colored stripes are Noro Silk Garden, while the off-white is Lamb's Pride. My initial plan was to knit until I ran out of yarn, but the scarf is nearly five feet long now and I've got quite a bit left. I do like my scarves on the long side so I can wrap them around my neck a couple of times, but still, I'm only 5'3" so "long" for me is really not very long as far as scarves go. ;-) So this is very nearly finished...at this point I'll probably just knit till I'm sick of it. 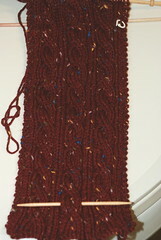 Needless to say, since I've got this super-warm scarf almost ready to go, we're having temperatures in the 60s lately. Typical. A while back when I pulled out my Rhinebeck purchases to photograph them, I didn't pack them up and put them away immediately. When I came back into the room a while later, I found this scene. 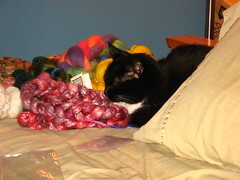 Maggie LOVES to lay in my fiber when I leave it laying around. She's so good about it, too -- she doesn't scratch at it or do anything untoward, just lays near/among it, sometimes using something as a pillow. I can even leave works in progress laying around, and while the cats do lay on them, they have never done anything Bad (except for one time when Gandalf gnawed on the end of a bamboo needle, but that was nothing a little sandpaper couldn't fix). I have the best kitties. I like Tuesdays. I don't go in to work until 1pm, which means I can sleep in a little and then have a few hours to do things before I have to get ready to go. I should do productive things, and sometimes I do, but for the most part I take the opportunity to read, knit, spin, watch tv -- something relaxing. Today I'm spinning. I spun half of this up last night, and hope to finish spinning the other half either this morning or when I get home from work tonight. 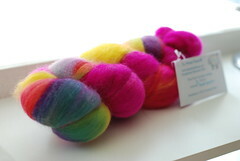 It's BFL from The Painted Sheep in the "Sweet Caroline" colorway. Isn't it happy? Perfect for a gray, rainy day like today. 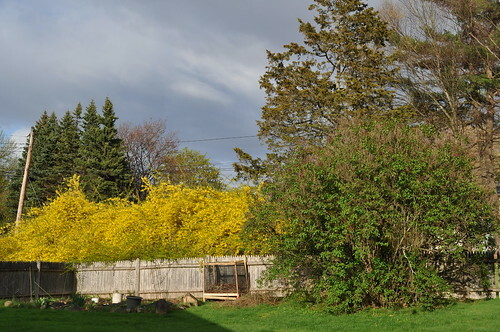 I think that patch of teal right in the front is particularly gorgeous. 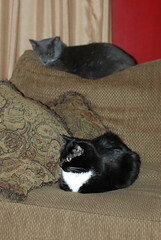 And now, if you'll indulge me a bit - Happy Belated Birthday to the two smallest members of our household! 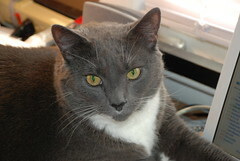 Yes, Maggie and Gandalf had a birthday - last Thursday, they turned nine. Nine! I've been lucky enough to know our kitties for their entire lives. They were from a litter of five kittens that my mom's cat had, and purely by chance I happened to be home visiting my mom on the day that they were born, so I got to meet them (and choose them!) when they were just hours old. Originally we were only planning to adopt one kitten, but when I met them I just couldn't choose between them - so from Day One we knew they'd both be coming home with us. This was, of course, before digital cameras and flickr and all that stuff so I didn't get daily updates or anything like that, but my sisters and mom did do a good job of taking lots of pictures and sending me copies of the prints. And knowing that these were the two we'd be adopting, Mom and my sisters gave them lots of extra attention and cuddles, and I truly believe that all that handling when they were tiny helped make the cats as affectionate and friendly as they are. 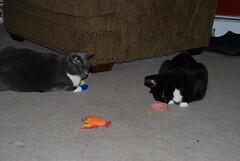 ...and a couple of new, nicely-catnipped toys. My sole focus this past weekend (and for the later part of last week, for that matter!) 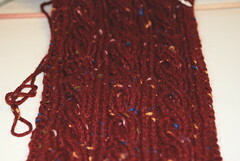 was the tangled part of the Tangled Yoke cardigan. It's the most complex cable I've ever knitted, and at the size I'm making, the cable was somewhere in the neighborhood of 450 stitches around at its widest point, so it was pretty slow going. 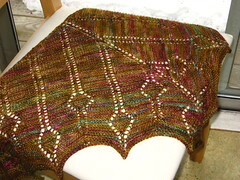 I took it one row at a time, though, and on Sunday afternoon I finished it. It came out pretty well, I think. As I was knitting it I was thinking that the cables really weren't popping much, but as soon I finished suddenly the whole thing looked much more popped. Go figure! 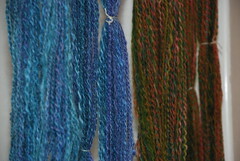 I still think that the Felted Tweed doesn't cable as nicely as other, rounder yarns, but that's fine. It's a rather subtle look, and I like it. This sweater, for being mostly all stockinette, has so many little details that I love. I really like the way the bottom ribbing looks as it moves into the waist decreases, and I love the fake side seam (formed by a column of purl stitches). 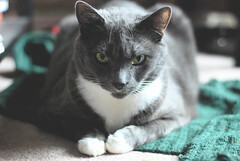 Gandalf was a great help as I was flattening TYC out on the floor to take these pictures. LOOK AT THAT KITTY TONGUE! 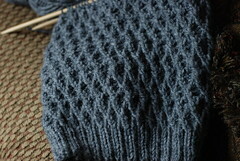 I was able to finish the post-cable stockinette portion before bed last night - the Oscars were just long enough! 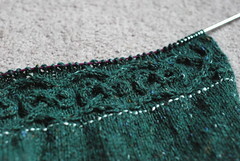 So now I have short rows to shape the back neck, then the neckband and the buttonbands, and the finishing. The end is near! I haven't been keeping track, really, but it seems like a large percentage of our storms so far this winter have fallen on weekends. I like it this way: it's so nice to not have to worry about what the ride to and from work will be like! I suppose if you are the sort of person who has a lot of weekend plans it would be annoying, but if you're like me and are always looking for a reason/excuse to stay home, it's great! So, it was a lazy day. I should have taken the opportunity to do something productive, but I didn't. Just Guitar Hero, internetting, and catalog-browsing. 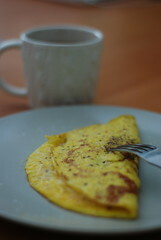 I did make myself a nice breakfast, though. I guess I didn't feel a real need to get things accomplished, since I have tomorrow off from work, too. I do love me a long weekend! In knitting news, I've been working on a Koolhaas hat, sort of. I say "sort of" because I didn't follow all the directions (whoops) and so it isn't quite right. It still looks okay, though -- just not with the nice sharp diamonds the original has. I'm literally ten rounds from the end now, at the beginning of the decrease section, but I have to tink back two rows because, once again, I can't read and I messed up the first decrease row royally. Tinking back is annoying because one round is cabled and the other has decreases, so it's just a pain. So I've been avoiding this for the last few days, but I should really just hunker down and finish it so I can move on to the next thing. As promised, here's the handspun I finished last weekend! 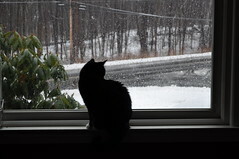 The pictures aren't great -- it's been really dark and rainy pretty much all week, and coupled with the early nightfall, the lighting in my house is practically nonexistent -- but you get the idea. 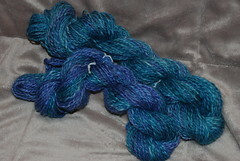 The first one is 115g of bluefaced leicester in the "Seascape" colorway, purchased from Zarzuela's Fibers. This is worsted or thereabouts (haven't figured out my weight or wraps per inch for either of these yet), and there are about 170 yards. It's two-ply, plied from a center-pull ball. 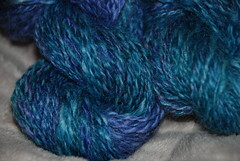 This was a little "sticky" to spin -- it was a lot fuzzier than previous BFL I've spun -- but the resulting yarn is delightfully soft and squishy, with just a bit of fuzz or halo to it. 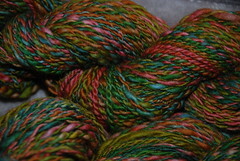 Next up is 110g of superwash merino in "Summer Woods", which I got from Spincerely Yours. 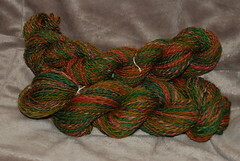 This is also two-ply, plied from center-pull balls. 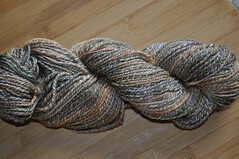 It's rather lighter, though -- about 282 yards altogether. This one is nice and smooth and soft, and it really does look like the woods in late summer or early fall. So pretty! Gandalf is SUCH a boy. Will you just look at this wholly undignified pose? 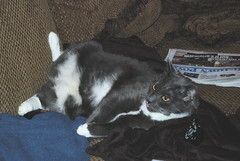 Maggie would NEVER lounge around in a manner such as this. 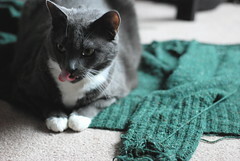 And it's hard to see at this size, but click on the picture to embiggen -- and check out the tongue action going on! 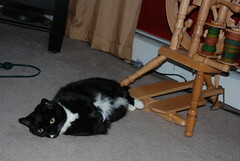 The last few mornings, I've caught Maggie hanging out by the spinning wheel when I get out of the shower. Usually she's more of a furniture cat in the morning, as she's settling down into a cushion somewhere for her first nap of the day....laying on the floor is usually reserved for the evenings, when she's trying to get our attention. But she and Stella the Wheel are becoming fast friends. 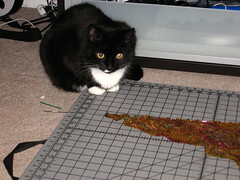 Perhaps Maggie would like to make her own yarn. It was a pretty low-key weekend here. We did housework and errands on Saturday, and today while Jim played volleyball and got together with some classmates for a study session (he's got midterms this week! ), I got in some crafting. After I enjoyed my extra hour of sleep, of course. Here's my current knitting project. Or, at least, the active project -- goodness knows that there are plenty of "current" ones. I'd been sort of floundering about for something new to start, and since this yarn has been in my stash and earmarked for this pattern for approximately forever and a day, I decided it was high time to get it done. This is the Irish Hiking Scarf, as knitters are probably aware. 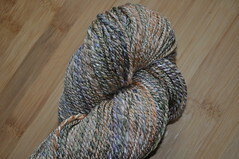 The yarn is Cascade Lana d'Oro Tweed. 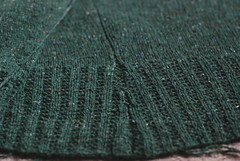 You may recall this yarn from earlier projects of mine (for which I am too lazy to get links at the moment) -- I made a top-down cardigan from it, and thus far have made a pair of Fetchings and a beret from the leftovers. I have three more skeins, and I decided that a matching scarf was in order to complete the hat/glove/scarf set. I made this decision, oh, two years ago? It's long past time to get this out of the queue and into the finished pile! The finished yarns have been washed and are now drying in the bathroom. Look for a post about them later in the week! Sweater weather is upon us! The low temperatures at night are dipping into the 40s, and I'm sure we'll have our first frost soon. I wore socks last night for the first time in months, and it felt heavenly. Oh, I do love cool weather! And just in time, my Tilted Duster is, finally, almost done. I am SO CLOSE to the finish line! My sleeves are sewn on and seamed, all my ends are woven in, and all I need to do is finish the collar. I started it the other night but set it aside until I could have someone else look at it. You see, I've always been of the school that when you're picking up stitches, it's better to make sure they're evenly spaced than to worry about exact stitch counts. With this in mind, I picked up all of the collar stitches -- only to discover upon counting them that I had about 40 stitches more than were called for in my size, and about 20 stitches more than called for the in largest size. !!!!!! 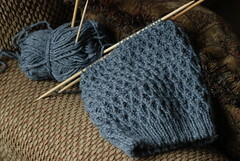 I knitted a few rows and it looked okay, but I set it aside until I could get a second opinion. Today, though, I got to show it off, and the consensus was that the number of stitches looked fine. So I'm plowing ahead. Fingers crossed that it does, in fact, work out. I'd hate to have to rip back this close to the end! And what knitters did I get to show off to? Cygnet hosted a spin-in at her house! Sadly, camnesia struck (for all of us, I think?) and there are no photos! It was a lovely day, though, and I had a lot of fun spinning and knitting (and eating) with Cygnet, Tamara, JessaLu, Amy, and blogless Carla. Thank you, Cygnet!! 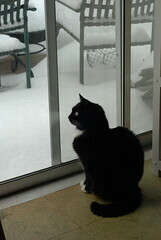 And here's a Gratuitous Cat Picture, lest we have a photoless post. 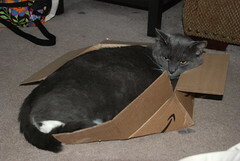 Gandy appropriated this Amazon box as his very own, and seemed to like it even more once it was busted open. Weird kitty. Just sending a test post from my iPhone to see how it works. I've had the phone for a month or so now but am only just getting around to installing the typepad app. Gandalf had a weepy, swollen eye that he was blinking a lot (and holding closed when he wasn't blinking) so off to the vet we went. The diagnosis? 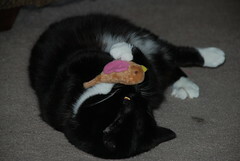 Feline herpesvirus. :-( He's been vaccinated, of course, but I guess the virus can be acquired in kittenhood and still flare up -- just like with cold sores in humans. 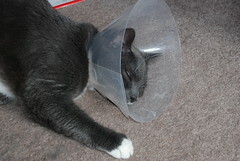 So he is suffering multiple indignities -- a cone hat (which, incidentally, is "small dog" sized), two kinds of eye ointment (including one that dilates his pupil -- he must HATE that, plus it makes him look creepy), and an amino acid supplement delivered via allegedly palatable paste. He's a sad, pathetic boy and is moping around and bonking into things a lot. Poor Mr. Boy. Oh, and Maggie is afraid of him. Or afraid that she's going to end up in a cone, too. One or the other. Either way, we didn't see her for over 24 hours!